‘The Vampire Diaries’ star Nina Dobrev turned 25 on January 9, and just a day after that, she stepped out to Universal Studios on to the set of ‘Extra’ to eat cupcakes with host Mario Lopez. The beautiful Bulgarian Canadian actress and model showed up, bright and all smiles, in a black cropped tuxedo jacket by The Kooples over a white button-up blouse and a black flared skirt. What stood out (aside from the birthday girl, of course) from her ensemble were her butterfly stiletto pumps. The orange-and-white shoes are from Sophia Webster’s Spring 2014 collection and were a great contrast to Nina’s black-and-white outfit. They feature open sides, slim ankle straps, and a pair of white butterfly wings behind each shoe. 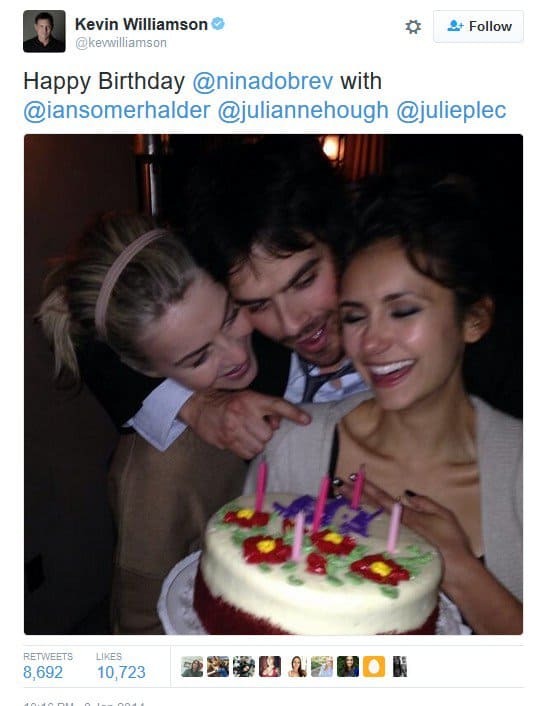 The night before and right after winning The People’s Choice Award for “Best Onscreen Chemistry” with co-actor and ex-boyfriend Ian Somerhalder, Dobrev was surprised by her best friend Julianne Hough with a birthday cake. A photo of the two girls, joined by Dobrev’s ex, was then tweeted to the world by Vampire Diaries’ writer and executive producer, Kevin Williamson. It looks like it was a really sweet celebration for this fan-favorite actress. Happy birthday, Nina!